AFV Club has now released the third in its T-34 series – the most widely built variant, the Factory No. 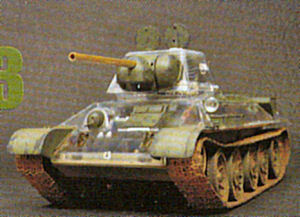 183 designed Model 1942 or “Gayka” (hexnut) turret version. As before it comes in a regular (AF 35144) and a special limited clear (AF 35S57) version, of which this review is focused on the latter. Essentially this kit uses most of the parts from the previous two kits (the T-34 Model 1941 Factory No. 112 kit - AF 35143 – and T-34-85 Factory No. 183 – AF 35145) with three new or modified sprues for the new turret and details and for the pre-April 1943 revision to the road wheel design. The latter used cast road wheels with rubber tires at the first and fifth road wheel stations and cast internally buffered road wheels on stations 2, 3 and 4. The kit provides them, happily with the “hard” styrene black tires and not vinyl. As with the previous two kits AFV Club has stayed conservative. It does come with actual steel springs for the Christie suspension units; these seem much weaker and should be easier to install without 20 or more fingers. If installed carefully the complete suspension works. As it shares parts it shares details. Detailing starts with the floor and moves forward. Separate details abound in the control (drivers’) compartment and include rodding for the foot pedals. Ammo racks are provided with only half a shell; however, since this cements to the ammo rack trays for single rounds, it is a smart way to ensure you can paint the round AND the rack with a minimum of grief. Seats are neatly done with separate thigh pads and even machine gun racks look the part. The V-2 engine is complete, but is one of the few areas in the model where AFV Club still continues to make a mistake. In the first kit somebody put the original 1940-early 1941 air cleaner (sort of like that from an older American car with a carburetor) on top of the engine (parts A31/A32) but then includes the later “cyclone” type air cleaners behind the transmission firewall. While the first kit did have a changeover from one to the other all of the later kits use the “cyclone” types. I have seen one individual expound on the Internet about such an arrangement being in use, but the factory blueprints for these tanks do not support that claim. As before the latter are not only correct but necessary as the exhaust pipes attach to them on the way to the exhaust outlets in the rear of the hull. The transmission comes with the odd “ribbon brakes” in place on each final drive/lateral clutch assembly (A43-A46) and the fan is a four-piece marvel of the moldmaker’s craft. Note that the main clutch is in the center of the fan. The radiators each consist of three parts and fit as required next to the engine. While the model still comes with three different options for the idlers and drivers (1940, 1941, 1942 and beyond) only the B33/B37 for the idler and B9/B13 for the driver are the most accurate. The tracks are a bit thin and floppy, so most modelers may want to use an after-market set for this kit. The AFV Club tracks are nicely done (Set AF 35173) and will be a good upgrade for this kit. The upper hull, stern plate, turret halves, and roof are all molded in clear styrene. This is slightly marred by ejection pin marks on the inside of the rear fenders, the stern plate and the turret roof; removing them will take careful sanding, buffing and a touch-up with Future or Johnson’s Klear. All radiator louvers - intake and exhaust – are positionable, but the rear deck is solid so if you wish to display it you will have to leave the covers (D53, D54, D5) loose. There is a single etched grille for D5 which is a good choice. The kit comes with spare track but seems to have lost one of the “toothed” links in the process; the links bolt to the ends of the fender with one “flat” link on the bottom and one “toothed” link tooth up above it. The kit has two “flats” on the right and a single “toothed” on the left. Possible, but an odd choice. The turret is nicely done and comes with a very complete F-34 gun breech and coaxial DT machine gun back end. There are details everywhere you look, but the clear plastic turret will cause some problems when completed due to attaching the parts to the inside. Five finishing options come with the kit, two in 4BO green and three in white: “Khabarvoskiy Kolkhoznik”, winter of 1942 (red name on whitewash with green lower hull); White 163, Kharkov, winter of 1943 (white with green patch for bort number); “Chelyabinskiye Kolkhozniki”, Kursk, February 1943 (4BO with name in white); Winter 1943 (whitewash overall); Panzergrenadier Division, Brandenburg, East Prussia 1945 (whitewash with “4519" and black outline crosses. Design of this kit is credited to “Team Niitakayama”. Overall this is a super effort and other than the continuing air cleaner kerfluffle is a winner.